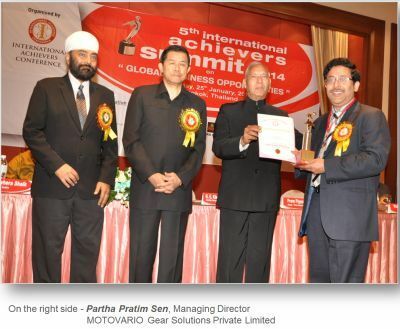 The managing director of the Indian branch, Partha Pratim Sen, has been recommended by the Advisory Committee for the International Award for Business Excellence Achievers, which will be held at the Holiday Inn Bangkok January 25 2014 during their fifth international summit . IAC (International Achievers conference) promotes and encourages individuals and companies that contribute to the development of India's economy achieving commendable results. The approval of the nomination takes into account the past history of the individual and the growth of the company in its sector. It is a celebration of entrepreneurial, organizational skills of the best managers. A tribute to the men who have been able to stand out in their fields. We are delighted that a member of the Group has been chosen Motovario as a possible candidate and that the Indian subsidiary is an example of developing and growth for the Indian market.